Here are some of the common questions that we get asked. What is The Hydrogen Bike? The Hydrogen Bike is an interactive display for interacting with your own energy. Of course. Everyone can have a go. As long as you can fit on the bike you will be able to make some hydrogen. How efficient is the reactor? 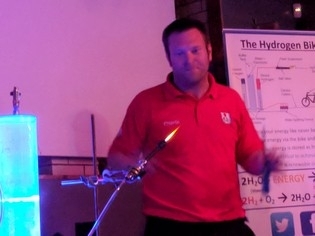 The lab-based reactors are upwards of 75% efficient, energy to hydrogen however due to safety we use bicarbonate of soda as the electrolyte on @TheHydrogenBike so we get about 55 % efficiency. We do however have far fewer issues with spillage or people touching the white solid that appears around the electrolyser as this is just baking powder. A model is available here to show how different energy inputs result in different hydrogen outputs. Every fuel by definition contains energy and is therefore inherently dangerous. There is a risk associated with every fuel use. You climb in your car and it could explode, you cook on gas and it could explode. You have to form your own view based on the risk and reward. That is part of what the Hydrogen Bike is all about. You can see your own flame and judge it yourself. What's with the three word address? 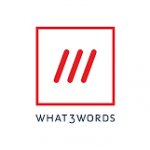 We use What3Words to accurately show where we are going to be. This is a new addressing system that allows an accuracy of 3 m x 3 m squares. Every 3 x 3 square on the planet has a 3 word address. This will hopefully help people to find us in a busy show download the app or visit the mapping site by clicking on the logo.